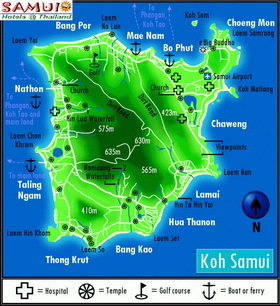 SamuiHotelThailand.com is the Koh Samui (เกาะสมุย) Online Hotels and Resorts Reservation. We do specializing in travel products ranging from city hotels to hideaway resorts. We offer you the most reasonable rates with the possibly fastest response and confirmation. We make your travel arrangements easy at the most reasonable budget and the very best value for money. Explore our site for exotic destinations to experience magical charms of Samui Island. Chaweng Beach, The longest, most popular and developed beach on the east coast of Ko Samui, this 7 kilometer beach has clean white sand and sparkling water. In addition to numerous accommodations, this charming beach is packed with restaurants, spas, souvenir shops, bars and discos catering to all the needs of visitors. In addition, there are a number of dive shops on the beach, some of which also organize night dives. 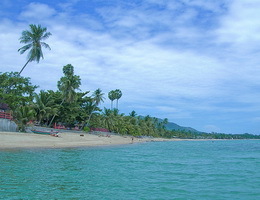 Lamai Beach is Samui's Second largest resort area after Chaweng. It is quieter and less bustling than its big sister, but still with plenty of accommodation, dining and shopping options to be found, and some great spas and tourist sites to explore. In terms of popularity, the tourist facilities and the quality of the beach itself, Lamai comes a close second to Chaweng, but with a less frenetic ambience. The general atmosphere is laid back and Lamai has slightly older. 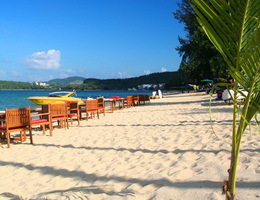 Maenam Beach , On the north coast of Samui is a five-kilometre golden white beach devoid of noisy bars and clubs. The sand is not as smooth as Chaweng's and the sea not as shallow, but it provides a quiet and remarkably tropical feeling. It is a great place to go windsurfing, especially in November and December. Bophut Beach, one of the oldest places on the island, the charming Fisherman's Village, it is fast gaining a reputation that stretches way beyond Samui for being the most elegant and well-preserved place on the island. Bophut is a very good compromise for those who want plenty of entertainment and yet plenty of peace and quite. Choengmon Beach is a charming, clean and peaceful beach which is ideal for deep relaxation which are dominated by a handful of three to five star resorts. Most of the resorts attract an older, package tour crowd, predominantly from Germany and France. This is reflected in the food and entertainment on offer in many of the resorts' restaurants. Bangrak Beach, This beach, which is locally known as the Big Buddha Beach, The water at Big Buddha beach is nice and calm and is excellent for those tourists that enjoy swimming in the beautiful sea offers a wide range of great attractions and activities for visitors.. As the beach is relatively quite, it is suitable for visitors seeking seclusion.